The growing domestic demand for high-quality horticultural goods in Sub-Saharan Africa over the past decade, driven by rapid urbanisation and the rise in supermarkets, offers opportunities to smallholder farmers to generate more income. However, access to these markets is still notoriously difficult for many smallholder farmers. The constraints range from low production quantity and quality to minimal access to capital, market information, agricultural technology, to limited skills in farm management. These limitations make farmers quite vulnerable to unexpected events and rapid changes, such as market instability and climate change. Such constraints are evident in the rural community in Nkokonjeru, Uganda, where our US-Uganda research team has been involved in horticultural outreach activities for the past three years. Main challenges identified at the start of this project include the need to increase and diversify incomes by greater access to markets; low productivity limited by water, fertilizer and disease; difficulty in acquiring training in proven technologies/techniques; minimal access to extension and limited demand-driven training of extension agents. Additionally, most extension focuses on traditional cash crops (coffee and matooke) and favors men who often dominate family finances. Our goal is promote horticultural crop production in order to boost farmers' incomes and increase the supply of nutritious foods within Uganda. Our approach combines two innovative and participatory agricultural extension approaches in Uganda - the Farmer Field School (FFS) and the Participatory Market Chain Approach (PMCA) . Both methods have seen success throughout the world. The FFS appears to be a useful tool to boost smallholder production of targeted crops but often comes up short helping farmers find markets for these new crops. Conversely, the PMCA has been shown to improve existing market chain linkages but generally between larger, resourceful farmers and well-established traders and processors. We see an opportunity to bring the two approaches together to complete the link between farmers and the markets they are producing for. When first asked which crop they would like to learn more about, farmers in Nkokonjeru Uganda overwhelmingly responded: our indigenous vegetables. 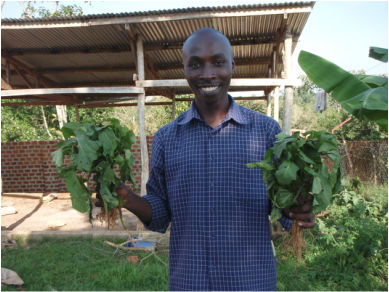 Indigenous leafy greens are commonly used for preparing sauces within the central region of Uganda, but their production for the market remained a mystery for these rural farmers. Farmers were inspired by the high prices received for the greens in urban markets because, in rural areas, these greens were commonly found along the road side and the common perceptions among farmers was that they could not be sold. Farmers named four indigenous greens to be targeted during the FFS and PMCA, nakati (Solanum aethiopicum), jjobyo (Cleome gynandra or spiderplant) bbuga (a red leaved Amaranthus spp.) and doodo (a green leaved Amaranthus spp.) Focusing on indigenous greens has opened up many new research trajectories.